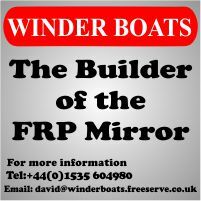 These are the recommended materials for the standing rigging (shrouds, forestay, jib strop) on a Mirror dinghy. Shrouds, forestay and jib strop (a jib strop is only needed on a gunter rig - that is, with a gaff) - Minimum 2mm diameter 19 core stainless steel wire so you comply with class rule 6.1.1. The UK MCA recommends 2.5mm diameter and this is commonly in use across the UK. From measuring the standing rigging of 69992 - Swanlake, it appears that in 1999 Widebeam were using 3mm diameter stainless steel wire for standing rigging. Exact lengths of shrouds and forestay vary depending on how they attach to the mast and to the hull. In general it's best to copy the item you are replacing. From measuring the standing rigging of 69992 - Swanlake, in 1999 Widebeam were supplying forestays that were 3108mm long, shrouds 3297mm and jib strop was 175mm. These are measured from the inside bearing surface of the soft loop which goes over the top of the mast to the bearing surface of the thimble in the eye splice. Swanlake was supplied with 'U' channel adjusters on the shroud blocks, so possible older boats with the old style Holt Allen cast alloy single attachment point fitting might have had a different length shroud. The soft loop is about 125mm in circumference measured around the inside of the wire from and to the ferrule. Needless to say, this loop needs to fit over the top of the mast, without being too loose. The top section of the mast is designed to be 35mm in diameter, and this section is 38.5mm long, it then thickens to 50mm diameter. On my boat the current forestay is 3200mm long, the shrouds are 3225mm long, and the jib (halyard) strop is about 150mm long. . These shrouds go to "U" channel adjusters on the shroud block and this length allows me to set up the mast rake as set out on the Goodwin Sails tuning sheet. The forestay has the traditional rope attachment to the forestay fitting . The length of jib strop, which carries the block through which the jib halyard runs, is not particularly critical - it could be a bit longer (or shorter). Winder Boats supply shrouds (with a Superspars Bermuda mast) which are 3160mm long (from the bearing surface of the thimble in the eye splice to the bearing (bottom) surface of the "T" terminal that goes in the mast. The Winder has a single point shroud attachment fitting on the hull which is low down (i.e. near the deck). A shroud adjustment plate is used to connect the shroud to the shroud attachment fitting (adding about 60mm to the shroud length, though this depends on where you put the pin). The forestay I measured (with a Clamcleat CL828-70 system) was 2975mm long. If you have a boat with "U" channel shroud attachment fittings about 90mm long (common on a lot of wooden boats), you will need shrouds about 35mm longer to get the pin near the middle of the "U" channel, so that's 3195mm from the bearing surface of the eye splice to the bearing surface of the "T" terminal. If you are going to have a traditional rope forestay attachment, you can have a longer forestay, say 3140mm long. If you make the forestay too long, the eye splice will be too close to the forestay attachment fitting, making it hard, or impossible, to tension the rig properly. Selden supply shrouds which are about 3140m long & their forestays are about 2950mm long. 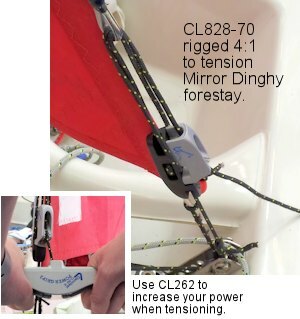 The forestay measured had a Clamcleat CL828-70 system (details below) which requires quite a bit of space, so you could use a longer forestay if you want to use the more traditional, compact, rope attachment. Superspars tell me they supply shrouds which are 3105mm long (between bearing surfaces), which seems a bit short (too me). There are a number of manufacturers of these items. Superspars make their own T terminals and backing plates as do Selden. There are other companies (e.g. Blue Wave,...) making T terminals. There are some known compatibility issues between T-terminals & spars. What information I have is in the table below. If you are getting rigging made up, it's advisable to make sure the riggers know what make of mast you have & either ensure they use the corresponding make of T terminal, or raise the issue of compatibility with them so you/they can check that the terminals they will use will fit your mast. Forestay attachment to the inside of the bow transom is typically using a length of line. A modern, high performance 3mm rope with a dyneema/spectra core and polyester braided cover (such as Marlow Ropes Excel Racing) is best to fit through the eye and minimize stretch so the required rig tension can set precisely. 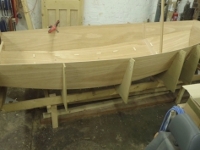 The traditional method is that It should start on the eye on the end of the forestay, then go down around the forestay attachement fitting (one with a stright pin is best) from aft forwards, then back up to the eye on the end of the forestay (passing from forward aft), then back down and up again another two times and finishing by going through the eye on the end of the forestay. With 3mm line you should find that, when tensioned, the line "binds" on itself in the eye on the end of the forestay. This means with the rig tension applied, the tail is not under tension, so it is easy to secure the line with a few half hitches. Going around in the direction suggested means you can use your foot (wearing shoes) to further tension the rig. The disadvantage of the traditional method is that it can be hard to let the tension off. You may need to feed the tail back through the eye to try and unbind it. For those wanting a more elegant solution, the Clamcleat CL828-70 or the Clamcleat CL828-70AN can be used to tension a Mirror forestay. 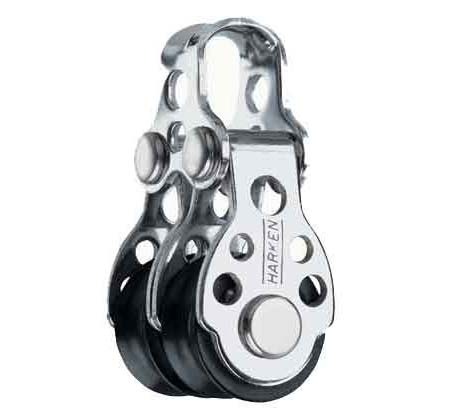 Friction could be reduced further by using a small double ball bearing block (for example a Harken HK406) on the end of the forestay.